Some of us got together yesterday to celebrate National Blueberry Month. When shopping for the event, I was excited about finding some beautiful local berries and I went a little overboard. Well, okay, I went a LOT overboard. I used the cup I needed for my Sour Cream Blueberry Crumb Cake and that left me with about 9 cups remaining. Frank made us blueberry pancakes twice in one week. I put them out each morning to be added to our cold cereal and I have used them in a smoothie. I made a second cake that we enjoyed for dessert last night but I am not sharing that recipe with you until next Tuesday when I write a book review about the novel from which it was inspired. This left me with about 3 cups of blueberries left and not a clue what to make with them. I also had a quart of strawberries that need to be used soon. I decided to combine these berries and stuff them into light, feathery crepes. Crepes are easy to make but a little time consuming so this is a great breakfast for those leisurely weekend mornings or any morning if, like us, you are retired. Sorry, I can't help myself LOL. These can make a very quick weekday breakfast as well. When you have some extra time you can make up a double batch of crepes. Place a piece of waxed paper between each, put them into a freezer bag and pop them in the freezer. 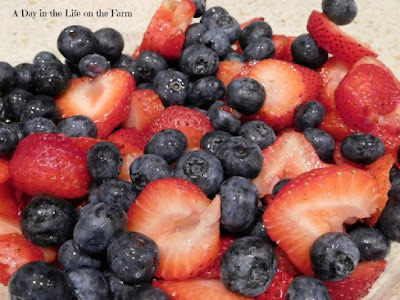 They freeze beautifully and can be removed from the freezer, placed on the counter and will be ready to be filled with your fresh fruit and served quickly and efficiently the next morning. You can just sprinkle them with powdered sugar, top them with whipped cream or pour your favorite store bought syrup over them. 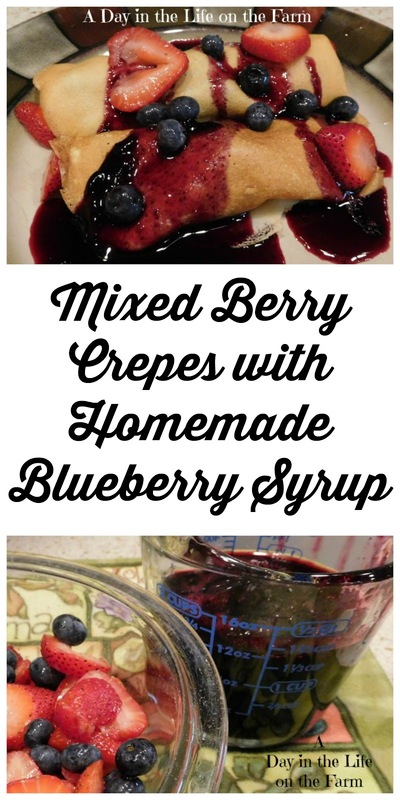 I still had blueberries to use so I made up some homemade blueberry syrup that was perfect for these crepes, wonderful on Frank's blueberry pancakes and excellent as an ice cream topping. 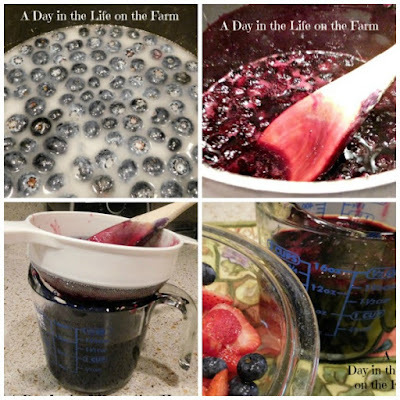 This is a great way to preserve blueberries for use after the season. This syrup should last up to a month or longer in the refrigerator. I think.....I have never had any last longer than two weeks in this household. It can be made with the blueberries that you freeze during the season as well. Place the milk, flour, eggs, sugar and salt in a blender and pulse until smooth. Place in the refrigerator overnight or for at least an hour before cooking. 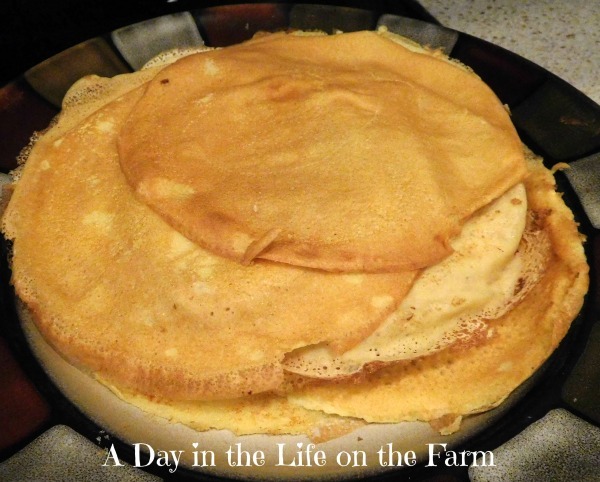 ***If you wish to make savory crepes omit the sugar in the above recipe. I can never get enough blueberries! 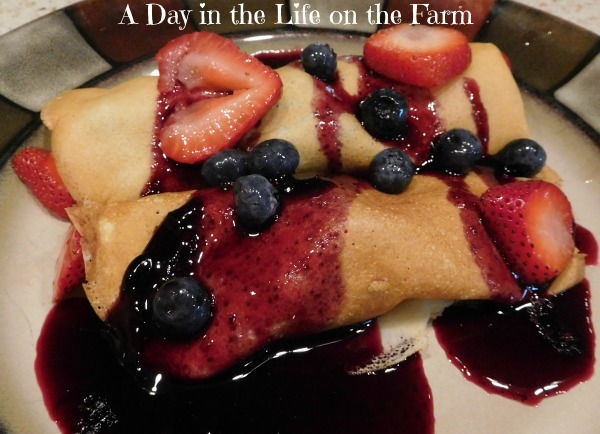 These crepes are just gorgeous!